We are an approved dealer of The Perth Mint, the only metals storage program in the world with a government guarantee. The Precious Metals Storage Account is composed of Euro Pacific Bank’s government-guaranteed, physical gold and silver accounts, giving you the security of physical precious metals while maintaining the convenience and access of a private bank. As a result, you can protect your purchasing power in spite of future currency, counter-party, and political risks, ultimately increasing your freedom. Travel the world without needing to take your bullion with you. Simply log into your Online Banking to track your Precious Metals Storage Accoaunt holdings, from anywhere in the world. 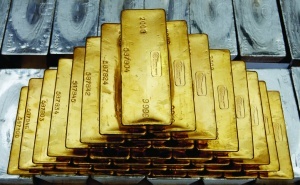 Physical gold and silver bars in The Perth Mint Depository. © 2012 The Perth Mint. There are three important security characteristics of the Precious Metals Storage Account. First, Euro Pacific Bank stores all precious metals through The Perth Mint in Australia’s government guaranteed Perth Mint Depository Program (PMDP). Second, Euro Pacific Bank is audited and regulated by OCIF in Puerto Rico and the international accounting firm Deloitte & Touche LLP. In addition, The Perth Mint itself is wholly-owned by the triple-A rated Western Australian Government and audited regularly. Euro Pacific Bank has approved dealer status at The Perth Mint, making us the world’s only offshore bank with this type of relationship. You can review the Bank’s listing directly from the Perth Mint website. For more details on The Perth Mint’s storage program and the safety of your metals, we encourage you to read this analysis of their gold and silver storage facilities and security. Easily convert cash in your bank account into physical gold and/or silver following the steps below. In the Trading menu, click Buy/Sell and Precious Metals Trading. Select the type of metal you would like to own and enter the weight or cash amount. You will receive a confirmation of your purchase and after the trade has been executed at The Perth Mint, your precious metals holdings will be visible in your Accounts Overview. Gold and silver are purchased and sold at the spot price + commission. *Orders are executed during Perth Mint business hours. Please note that only market orders are accepted. Gold and silver have historically been excellent ways to preserve one’s purchasing power over the long term. However, in today’s world it does not act well as a medium of exchange. In contrast, many of the world’s fiat currencies are now being questioned as a store of value, but are still used predominately for exchange. 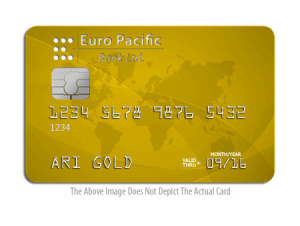 Euro Pacific Bank has introduced the world’s first Gold and Silver Debit Card to solve this problem. Now, in a cost effective manner, clients can have a bank account denominated in gold and/or silver with an optional debit card. The debit card we issue is accepted in over 210 countries and territories and millions of merchants worldwide. You will be able to track account transactions online through our banking software. The card must be linked to a Euro Pacific Bank cash account. Once this account is activated with the minimum deposit (see below), the debit card can be purchased. This process may take up to three weeks. In order to use your debit card, it must be funded with cash. In addition to your initial minimum deposit, more cash can be placed into your Euro Pacific Bank Account at any time via wire transfers. You then fund your debit card from monies held within your Euro Pacific Bank Account and use the debit card to make purchases worldwide. You can also increase the balance in your Euro Pacific Bank Account by selling your gold and silver holdings. The debit card is not mandatory. You can still open a Precious Metals Storage Account without purchasing the card. The card simply provides a facility for more quick and secure access to your funds. The primary cost for a new card holder is the initial purchase of the card, which is a one-time fee of $150. This fee covers the cost of the card and delivery charges for regular mail. Traceable courier shipping is recommended for clients outside of continental Europe.